It seems that social media is rife with giveaways these days. I can’t scroll through my Instagram feed or go more than a week without seeing or being tagged in another artist’s giveaway post. I even see a lot of artist’s accounts that include “Giveaway at ‘x’ followers” or something similar in their bios. Everyone is doing it, so it must be useful, right? I have come to the conclusion that for the most part, giveaways are overrated and new artists think they need to host one right away in order to compete with other creators and grow their following. In my experience, giveaways aren’t all that spectacular, and they may not do more than frustrate you. What’s the main point of a giveaway? Giveaways can be really beneficial. They have to benefit the giver in some way, otherwise it would be silly to keep doing them. So what are some of the potential perks of a giveaway? Yes, those things sound great! The issue is just how much can you expect from a giveaway? The biggest reason smaller accounts do giveaways is to gain new followers, and this is where they can be a let down. When it comes to rewarding current followers and keeping your current community engaged, giveaways can easily be successful. How can you gain followers with a giveaway? Through asking others to tag their friends/family or share your post your work will be exposed to a new audience. If these people like your work and like the item(s) you are giving away then they will follow you and tag more people. And the cycle continues. Plus, if your giveaway post gets a lot of engagement, it can potentially be boosted in the discover feed giving you access to an even larger audience. But just how many new followers can you expect from a successful giveaway? If you are just focused on increasing followers, a giveaway might disappoint you. When I hosted a giveaway at 300 something followers last year, I gained less than 30 new followers and had under 15 entries. When I hosted a giveaway two weeks ago (my account was at 60k) I gained 700 new followers and had over 200 entries. I’m sure the numbers are different for other accounts, but this at least gives you a frame of reference for what a giveaway can look like. Ultimately, the success of your giveaway hinges on whether you are giving away a product that your audience wants. Free stuff is cool, but useful free stuff is even better. 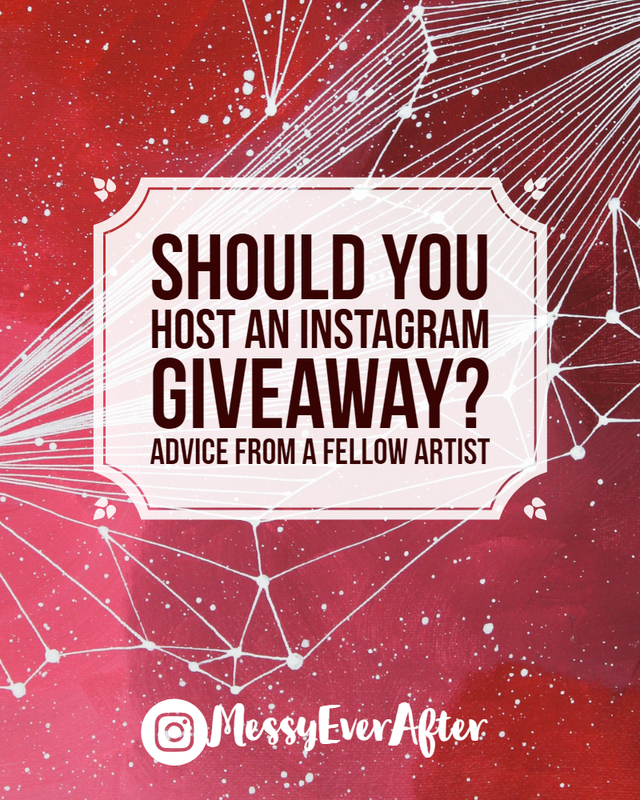 Should you host a giveaway on Instagram? First of all, you don’t have to do a giveaway just because everyone else is. I am a huge proponent of goal setting and doing things with intention. Which is why I encourage you to plan things out, be strategic with your future giveaways, and make sure that it is the right decision for you and your account. I’ve hosted multiple giveaways over the last year and my followers did increase, but not much more than their usual rate, so any giveaway you see from me will never be done to gain followers. Instead, I host giveaways to celebrate new milestones and show my appreciation for my existing followers. I also host giveaways to increase my brand recognition like encouraging people to use #messyeverafter on their posts. It’s up to you to decide what is right for your account, but don’t feel any pressure to host a giveaway just because the other kids are doing it. If you are going to host a giveaway, I have a few tips to help make it successful. 1. Give a product that your audience actually wants. If you don’t have many followers (under 1000), you won’t get much interest in your giveaway if you are only offering your art. Even if your art is really awesome and especially if a bunch of your followers are artists themselves. Instead, think about offering art supplies with your art. You can partner up with different art supplies companies and host a giveaway with them. A lot of your followers will probably be fellow artists, so giving away art supplies will attract more people to enter your giveaway. Once your following grows, your art will definitely be sought after as a prize and you will have more marketing power to get free supplies from companies to decrease your costs. 2. Don’t give away items that have limited uses. For example, a hand painted case for an iPhone 9. You will only attract super specific people with these items. 3. Keep your costs low. Establish a budget and don’t go crazy with the items you choose to give away. Factor in domestic vs. international shipping when choosing your items. Sure, giving away an 18”x24″ canvas might sound awesome, but when your entrant from Australia wins and you have to pay $60 to ship internationally you might cry actual tears. 4. Wait until you have a sizable following. The more followers you have, the more successful a giveaway will be. 5. Make it easy for people to enter the giveaway. Or you can have people enter through a google form or website: I like this because I can collect more information about people and pick winners more easily. Asking people to leave Instagram might decrease the amount of entries, but you’ll know they are at least more motivated. When are your followers most active? I usually post sales, giveaways, and anything I want to get a lot of attention Tuesday through Thursday between 9am and 12pm Pacific time. This works for me, but look at your current posts to see which have been most popular and take notes on when you posted. Historically, I get the most interest on a giveaway post during the first 24 hours of posting and I usually run them for 4 days or less. Once you post, give gentle reminders in your Instagram stories and in the captions of following posts, but don’t let that be the only thing you talk about for a few days. I always choose my winners at random. I copy and paste all of my entries into a spreadsheet and then use Google random number generator to decide the winner, but you can choose a winner however you want. Just make it easy on yourself to keep track of entries when planning your giveaway. I usually announce winners on Instagram a day or two after the giveaway ends. How many new followers do you want to gain? How much interest are you hoping for? The larger your account, the more engagement you’ll get on your giveaway (again, this is why I say wait until your following grows.) Unless you work some kind of internet magic, don’t expect to gain thousands of new followers while trying to giveaway an 8″x10″ print or canvas. This is a great chance to build a community around you as an artist. Don’t fixate on what a giveaway will do for your account, but focus on what you can do for your audience. I know it’s easy to obsess over the numbers (says the girl who has a spreadsheet to track her Instagram account growth…), but cultivating a dedicated following matters much more than the number itself. In conclusion, if you are only hoping to help grow your Instagram following, I wouldn’t use a giveaway to do it. Instead, grow your following for free by putting in the daily work of posting and using niche tags (read this and this). If you just want to reward your current followers and have some fun, then by all means, host that giveaway! I hope this was helpful! If you have any questions or comments, please leave them below or reach out to me directly. I’m always happy to help out another artist and even offer my coaching and consulting services. Visit the Messy Ever After store.